IITA Rwanda held a retreat in April to develop a new country strategy and set the agenda that will guide IITA’s transformative research work and innovation in the country. The four-day event included activities by IITA staff focused on teambuilding, sharing personal and team strengths and ambitions, and identifying ways to build on these strengths to articulate a clear vision for IITA Rwanda. 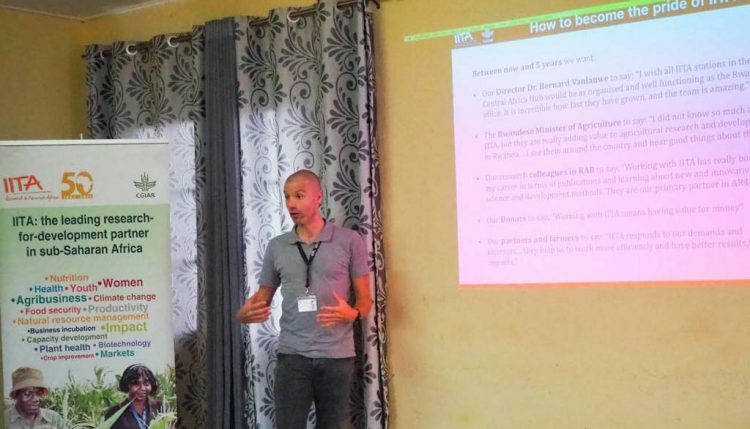 Country Representative Marc Schut led the team in discussing how the Rwanda station should adapt to the changing status of the organization in the country. Staff members gave presentations and workshops on professionalism, improved specialized skills including writing and communication, social media, and general etiquette in conducting relevant work in Rwanda. The team developed a new vision statement and mandate in the context of the research activities in the country relative to Rwanda’s agricultural development agenda. Vision: Contributing to transforming Rwandan agriculture through innovative research and partnerships. Our mandate: To advance science and strengthen capacity in Rwandan banana-, cassava-, soybean- and maize-based systems by collaborating and co-investing with governmental, development, and private sector organizations. High on the agenda for the team was also to deliberate on ways of creating and maintaining strong partnerships with government agencies, local and international organizations, and various foreign government development agencies represented in Rwanda. As part of the efforts, IITA Rwanda invited representatives from main partner organizations including Rwanda Agricultural Board (RAB), University of Rwanda, Ministry of Agriculture (MINAGRI), ENABEL, Belgian Embassy, Food for the Hungry, Caritas, One Acre Fund, and the Agricultural Chamber of Commerce to join the team on the two final days of the retreat. The high-level interaction with representatives from partner organizations provided feedback on IITA’s new mandate and opinions on the organization’s positioning within the research community in Rwanda. The partners further provided input on their specific interests in main themes that IITA Rwanda is working on including ICT4RAg, Scaling of innovation, Capacity development, Seed systems, and Youth and agribusiness as well as on the main value chains for cassava, banana, soybean, and maize. Dr Charles Murekezi of MINAGRI highlighted potential linkages and entry points for IITA to contribute to projects including aflatoxin mitigation in maize and seed multiplication in soybean. 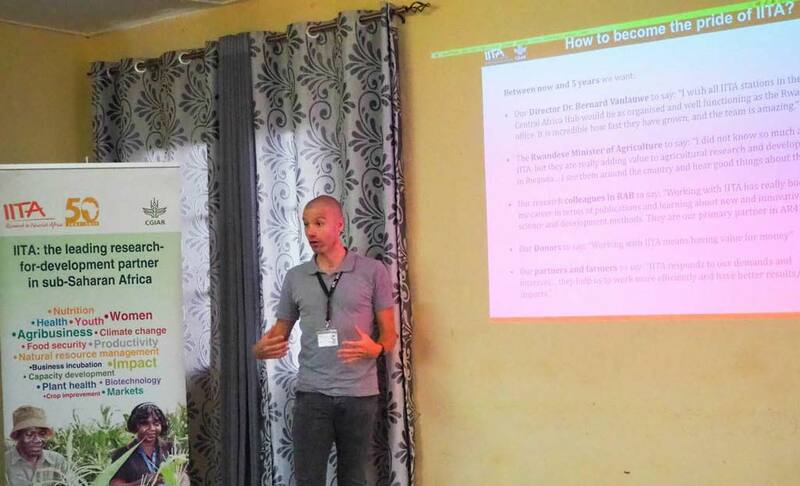 According to Schut, the retreat was significant in helping identify potential areas of collaboration and focus to develop concrete work plans for the next five years of innovative research and partnerships for transforming Rwandan agriculture. IITA in Rwanda has a decorated history contributing to agricultural research and development work that dates back to the 1980s. The success achieved is directly attributed to strong partnership with RAB and overarching collaboration with several government agencies, nongovernmental organizations, and international research partners. In the last three years, the country office has seen a rapid expansion in the research activities and engagements, and staff numbers with several major projects intensifying work in Rwanda. In 2018, IITA in Rwanda boasts of four major projects including CIALCA, BMZ-funded ICT4BXW, the Roots, Tubers and Bananas Scaling Fund, and the IFAD-funded Cassava Brown Streak Disease Control Project.